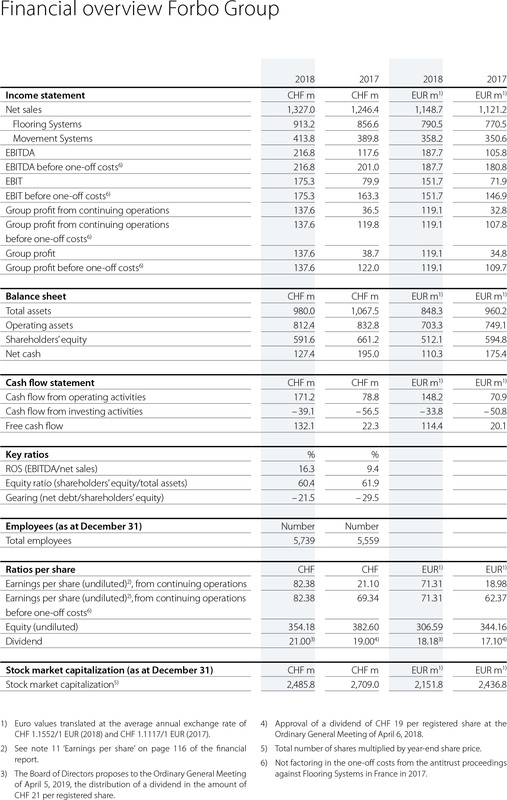 Below you find some financial key figures for the Forbo Group. Forbo shows a solid profit trend. 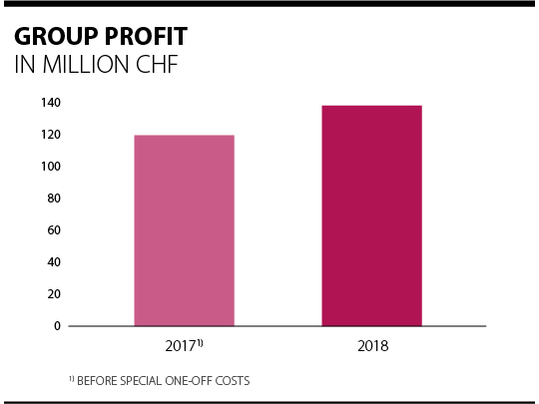 After tax-related one-off effects in the previous year and based on the Group’s solid operating income as well as a slight increase in financial income, Group profit from continuing operations in 2018 rose by 14.9%, or CHF 17.8 million, to CHF 137.6 million (previous year before one-off costs: CHF 119.8 million). The 2018 tax rate was 21.7%. 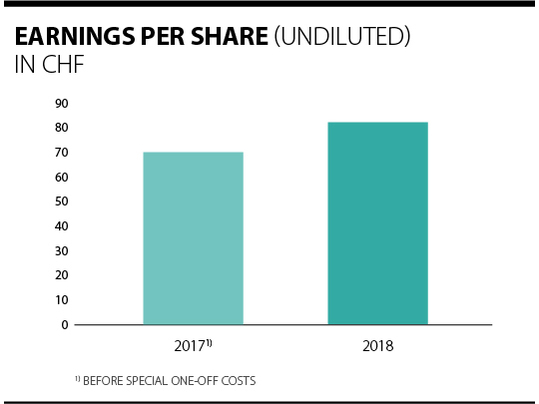 In 2018, undiluted earnings per share from continuing operations rose by 18.8% to CHF 82.38 (previous year before one-off costs: CHF 69.34); the increase was due to the Group’s higher operating income coupled with the share buyback effected in the course of 2018. Earnings per share are calculated by dividing the net profit or loss for the year attributable to registered shareholders by the weighted average number of registered shares issued and outstanding during the year, less the average number of treasury shares. 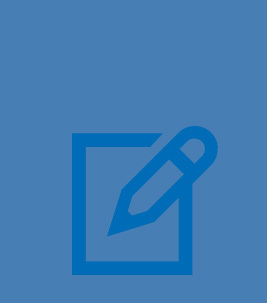 In addition to increasing efficiency and steadily streamlining processes, our focus is primarily on factors that are geared to promoting future growth. Capital expenditure in the year under review returned to the high comparable level of earlier years, following a steep rise the previous year, which was due mainly to the construction of the new Movement Systems plant in Pinghu/China. 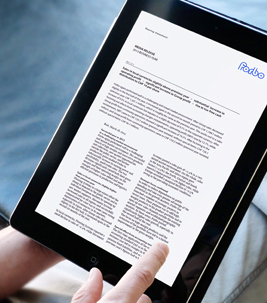 In the reporting year, Forbo concentrated its resources in both divisions on key activities and strategic projects in the areas of product portfolio, technology, production capacity, and market expansion. 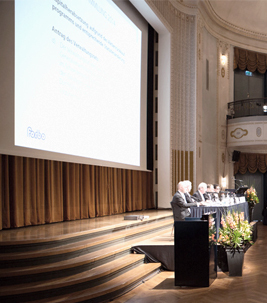 Total Group investments in property, plant, and equipment and intangible assets in 2018 came to CHF 38.7 million, which was CHF 19.1 million lower than the previous year (CHF 57.8 million). 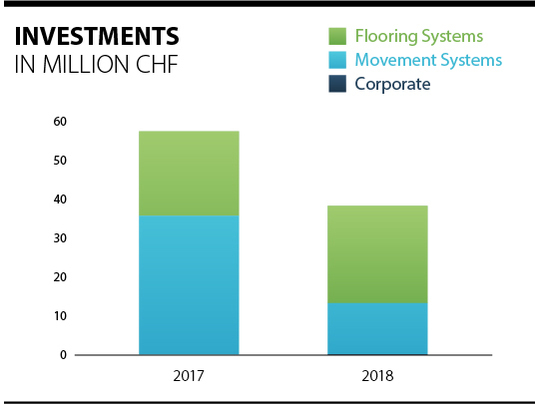 In 2018, Flooring Systems invested CHF 25.4 million (previous year: CHF 22.3 million), an increase of 13.9%. 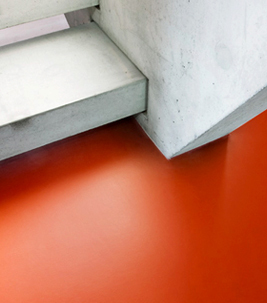 This sum includes the installation of a new digital printing facility with UV ink technology for luxury vinyl tiles plus expanded cutting capacity at the same production facility in the Netherlands. 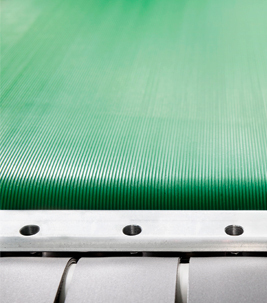 In the UK, Forbo installed a new needle punch machine for the production of carpet tiles and replaced a large press for the manufacture of Flotex that recycles scrap material into granulates in order to produce new backings for modular floor coverings. There were improvements at other manufacturing sites as well, including oven presses with reduced energy consumption, the modernization of heating plants, exhaust air systems and filter installations, plus additional silos and tanks for more efficient processing of raw materials. At Movement Systems, investment in property, plant, and equipment in 2018 came to CHF 13.2 million, a decrease of CHF 22.3 million versus the previous year (CHF 35.5 million). After two years of exceptionally high investments to complete the new plant in China, besides various new tools for the fabrication, there was a bigger investment made in the USA, where a new high-performance mixing plant for production pastes was installed, while for the fabrication center in Slovakia a state-of-the-art waterjet cutting machine for perforated belt types has been developed and built.